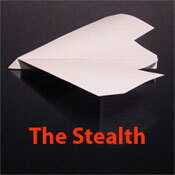 The Stealth is a sweet little paper airplane. It doesn't travel too far but its fast and it can pull off some pretty cool stunts. 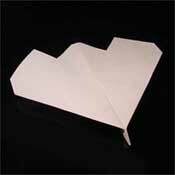 To make this paper airplane you will need only a single sheet of paper, a ruler, and a pair of scissors. 1. Fold your paper in half long-ways. 3&1/2 inches along the end. Then between the 1&1/2 inch mark and the 3&1/2 inch mark, make another mark about 1 inch up, connect the dots, and cut along the lines. See the picture to the left for clarification. This pattern can be customized too, don't feel locked in! 3. Open the paper airplane up put it down as shown. Fold each corner in towards the center to the point where the inside edges are even with the centerline crease. 4. The bottom edge of the corners that you just folded down should create a straight line across the page. Fold down at this line. 5. Fold the corners down again similar to what you did in step 3, folding each corner in towards the center to the point where the inside edges are even with the centerline crease. 6. Flip the plane over and fold it in half. 7. Fold the first wing so that the outside edge runs parallel to the body. Make the fold about 1/2 inch in from the center. Step 8 shows this more clearly. 8. Fold the other wing exactly as you did the first. Your Stealth may need some fine-tuning before it will fly perfectly straight.